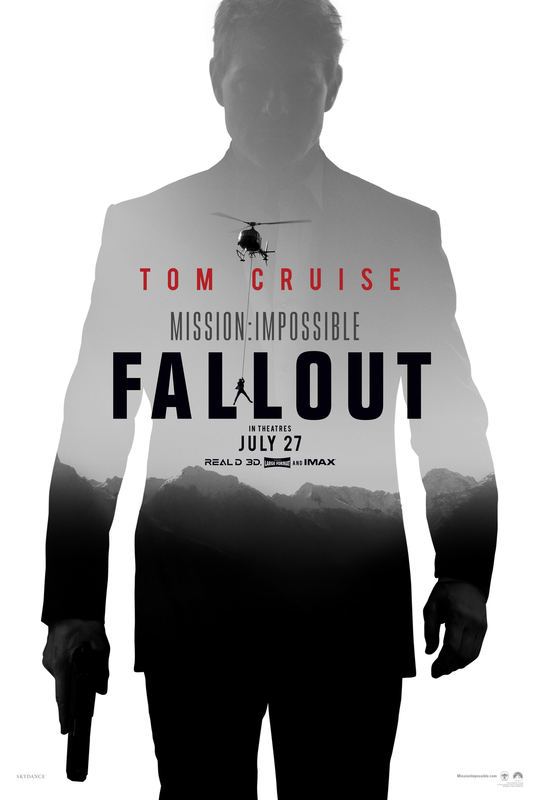 Tom Cruise stars in Mission Impossible: Fallout. OKLAHOMA CITY – Cary, Brazle, and I watched the new Mission Impossible movie Friday. Though it has some elements that I find distasteful, it also has some amazing sequences that more than make up for it. I give it a 7/10 and recommend it. What do I find distasteful? That’s a great question; I’m glad I asked. First and foremost, I dislike the picture quality. Rather than being crisp and clean, much of the picture is slightly fuzzy. I’m not sure if this is a problem with projection (here’s an interesting article on some projection problems that can lead to a less-than-optimal viewing experience) or a deliberate choice by the filmmakers. Either way, it seems to be a consistent element of modern films, and I’m not a fan. Also, many of the colors seem to be deliberately muted. This is not to say the lighting is dim – it isn’t. Rather, the colors are not as vibrant as I’d prefer. In fact, there are actually moments where it looks like we are watching the action through sunglasses; the effect is that distinct. Again, I’m not sure if this is a projection problem or a choice by the filmmakers, but it’s not my preference. The other thing I remember with disapprobation is the script. It isn’t an enormity, but there is a small amount of annoying exposition including at least one moment that make me think either the writers are idiots, the writers think we are idiots, or both. It doesn’t kill the vibe, but it is distracting. Before I get to what I liked, I need to comment on the soundtrack. It isn’t as memorable as Giacchino’s Ghost Protocol score, but there are some things I really like. Mostly, I like the way composer Lorne Balfe uses the theme song in new ways. For example, listeners will hear the familiar notes put to a different rhythm; this put off a great effect. Also, Balfe (or whoever arranged/orchestrated the music) mixed in a chorus with the typical instruments at times, making for a new, glorious rendition of the grand MI theme. Beyond this, the soundtrack is largely forgettable. I think I shan’t be purchasing it, but I will enjoy hearing it if I ever watch the movie again. Now for the good stuff – what I liked. The primary thing that really jumps out is the action. This is a thoroughly well-done action movie. Car chases, motorcycle chases, foot chases, hand to hand combat, knife fights, big guns, helicopters, crazy stunts – this movie is a cornucopia of action. I compare it to Mad Max: Fury Road because, like MM:FR, this has extended action sequences that keeps viewers completely engaged and drive the narrative forward. I love it. The other thing I really like is the return of trickery. In discussing the movie afterward, we ALL agreed that there were parts that took us by surprise. This is especially meaningful because Cary has an uncanny knack for figuring things out very quickly. In fact, he’s so good at figuring out what will happen that he normally doesn’t watch trailers because they give too much away and allow him to accurately predict the plot. However, he watched this trailer and thus came into the film with firm expectations regarding the plot. When the narrative didn’t play out as expected, he happily remarked that the filmmakers had actually used the trailer to misdirect, a very cunning ploy indeed. I can’t fully expound on HOW they used the trailer to misdirect on account of I don’t remember his whole thesis, but suffice it to say, he is convinced they actually made the trailer part of the whole experience. Great stuff. In the end, this is the third best Mission Impossible movie. It isn’t great, but it is good, so I recommend it. PS – It seems important to note that Henry Cavill is not a good actor. Great review Grant! Glad you included the bad as well as the good. Enjoyed your tasteful use of quasi-archaic words. Keep up the reviews – lots of fun reading them!